The state of our state is historically strong! More people are employed in Wisconsin than ever before in the history of our state. And just last week, the Department of Workforce Development announced that the unemployment rate had dropped to 3.0 percent. The only other time it was that low was in May, June and July of 1999 - when Tommy Thompson was our Governor. Things were pretty good back then, they’re pretty good now. And they’re only getting better. On Wednesday, I unveiled our new Ambitious Agenda for 2018 in the State of the State Address at the State Capitol. 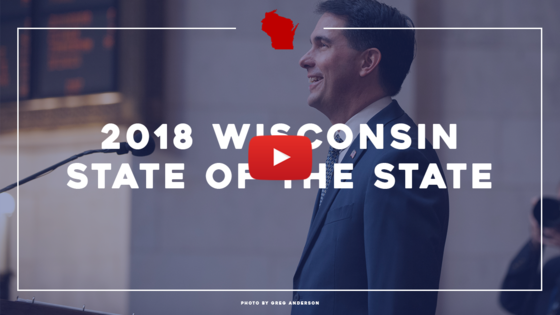 Our agenda is a comprehensive plan to keep Wisconsin moving forward in 2018, and it includes a $100 per child tax credit, more resources for our schools, bringing stability to health care, developing Wisconsin’s workforce, welfare reform, and more. Watch the speech by clicking the video above, or head over to our website to learn more. Good news! Our reforms our working. Our economy’s growing. And the nonpartisan Legislative Fiscal Bureau recently announced the current state budget is expected to end with an even larger than expected surplus. Our plan for that money is simple. We want to give it back to Wisconsin families through a $100 per child tax credit rebate this year. Families across the state will receive $100 for every child, under 18, living at home. A couple hundred dollars more in the family budget could really make a difference, particularly when getting ready for the next school year. 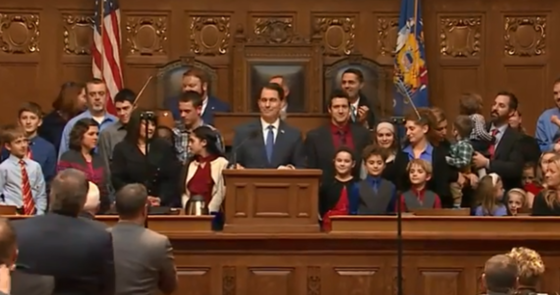 In my State of the State Address, I called on the members of the Legislature to pass my plan so that, by the time Wisconsin’s kids go back to school in the fall, their parents will have a check in the mailbox. We enjoy sharing all the great news about our state with you. It is an honor to serve as your Governor and represent the people of Wisconsin.